Supply, NC – Yesterday at the regular board meeting of Charter Day School, Inc., Chairman John Ferrante, Esq., announced that South Brunswick Charter School (SBCS) has secured an option to purchase a 45-acre wooded site for its permanent campus. It has also leased a suite of new classrooms for its first year of operation while procurement and construction is completed at the permanent site. The 45-acre permanent campus is conveniently located on Sunset Harbor Road, one mile south of Hwy 211. Sunset Harbor intersects Hwy 211 five-and-a-half miles east of Hwy 17 and three-and-a-half miles west of Midway Road. 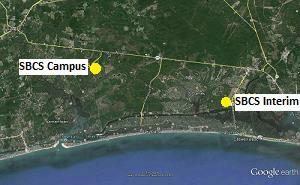 This location places the campus midway between Supply and Southport. The permanent campus site is on a high, well-drained sandy plateau with many acres for playgrounds, athletic fields, and nature trails for classes to explore while learning about the environment. For the interim campus, SBCS has leased a conveniently located site at 4128 Vanessa Drive, off of Long Beach Road. The interim site is in the South Harbour professional center, behind Jumpin’ Java Coffee and directly across from the Cape Fear Regional Jetport. There is an office and classrooms for the K, 1, and 2 grades, as well as lots of playground space and convenient access for parent drop-off and pick-up. This location will be a fantastic home for SBCS while plans for the permanent site are being finalized. “With over a hundred students already enrolled, we look forward to a very successful year. We will replicate our sister schools in Leland and Whiteville which are Brunswick and Columbus County leaders in academics. The foundation is laid in these early grades for future academic success, and that is where our focus will be,” said Ms. Michelle Mena, Headmaster. “We anticipate completing the purchase of the campus and beginning construction this summer,” she added. South Brunswick Charter School is a tuition-free, public school open to all North Carolina children who choose to apply. The school has a unique, classically-based curriculum, frequent assessments for individual reading placement and acceleration, and uses Direct Instruction teaching methods. SBCS will serve grades K-2 in 2014-15 and will add a grade each year. Office hours at the interim campus will begin April 28, during which parents may ask questions or tour the campus. Hours are 8am-10am Tuesdays, 4pm-6pm Thursdays, and 9am-11am Saturdays. The school is accepting applications, and parents can find enrollment forms and other information online at SouthBCS.org or may call 910-655-3600.